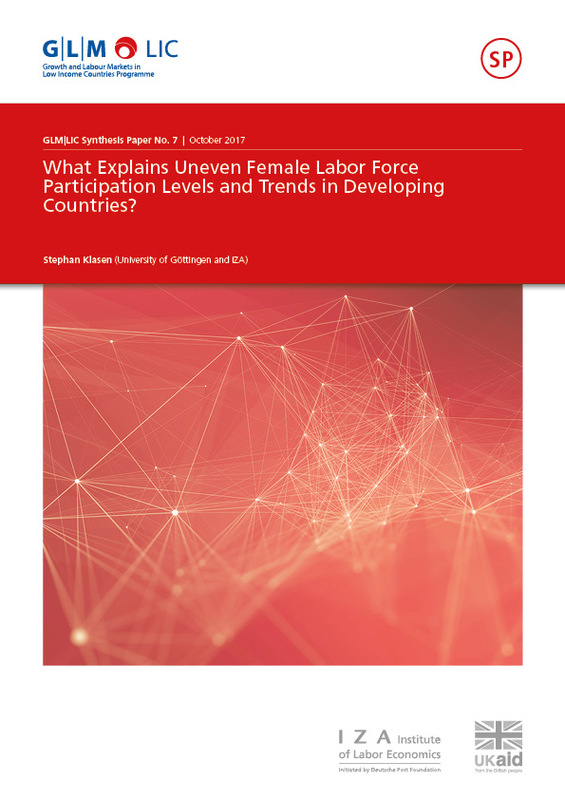 What Explains Uneven Female Labor Force Participation Levels and Trends in Developing Countries? Trends in female labor force participation (FLFP) have been quite heterogeneous, rising strongly in Latin America, while improvements were modest in the Middle East and female participation even fell in South Asia. These trends are inconsistent with the Feminization U Hypothesis but point to an interplay of initial conditions, economic structure, structural change, and persistent gender norms and values. Differences in levels are heavily affected by long-standing differences in economic structure that circumscribe women’s economic opportunities. Shocks can bring about drastic changes with the experience of socialism being the most important shock to women’s labor force participation. Trends are heavily affected by how independent women’s labor force participation is of household economic conditions, how jobs deemed appropriate for more educated women are growing relative to the supply of more educated women, and how much women are able to break down occupational barriers within the sectors where employed women predominantly work.